Want to help FBI agent Erica Reed solve a paranormal mystery? Back in the mists of time, Cognition: an Erica Reed Thriller was a successful Kickstarter, and launched its episodic mystery goodness in 2012. Now it's going one step further, and launches for tablets on the iStore today. Want a shot at creator of Gabriel Knight Jane Jensen's latest? Fancy a go inside comic artist Romano Molenaar's world? Then head on over to iTunes for episodes 1 and 2, or - if you're a Mac gamer - pick up the first three epsidoes on the App Store for $7.99 a pop. 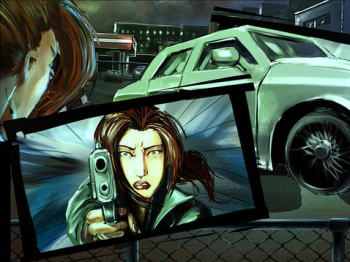 You play as FBI agent Erica Reed, who has a curious trick up her sleeve: the ability to see brief glimpses of the past. Now the serial killer who murdered her brother three years ago is back, and Reed had better use all the skills she's got if she intends to escape the bullet-ridden future fate seems to have planned for her. Each point-and click episode is self-contained, but also advances Erica's story, with a touch of paranormal horror. Is there a grand finale due? Why, yes there is, in September 2013. If you're looking to pick up the iPad versions, the first episode is $0.99, while the next is $3.99. Mac store? Mac store. Also, Mac store.